Lagos State Governor, Akinwunmi Ambode, delivering a lecture at the 2018 Executive Management Course of the Institute for Security Studies in Abuja, on July 24, 2018. 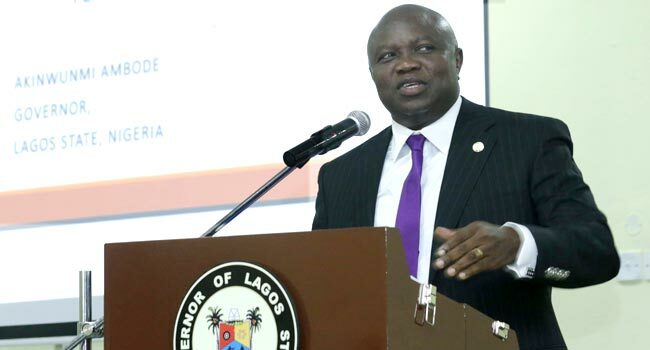 Lagos State Governor, Akinwunmi Ambode, says tackling Nigeria’s security challenges can only be better enhanced if concerted efforts are geared toward embracing community policing and strong intelligence gathering. He gave the recommendation on Tuesday while addressing participants of the Executive Intelligence Management Course II of the Institute for Security Studies in Abuja. The governor noted that to rescue Nigeria from its myriad of security challenges, paramount importance must be attached to improved intelligence gathering over the provision of physical security apparatuses. He stated that the security issues the country was grappling with, including international terrorism and insecure borders, local terrorism, proliferation of small arms into big cities, cyber warfare, drug trafficking, and human trafficking, among others, all pointed to the need for a strong intelligence gathering framework to be put in place to nip potential crime in the bud. According to Ambode, if policymakers such as the participants at the course cannot understand such security issues from the point of first-rate intelligence, then it will be difficult for effective policies to be made and implemented to combat them. “In the pursuit of the primus inter pares of all governance challenges, we have identified that the gathering and utilisation of intelligence are of paramount importance, even ahead of the provision of physical security apparatuses,” he said in a statement by his Chief Press Secretary, Habib Aruna. The governor explained that this was why his administration established the Lagos Neighbourhood Safety Corp Agency (LNSC) to enhance intelligence gathering in the communities. He said being the melting pot of diverse cultures, as well as a major economic hub and the fifth largest economy in Africa with a Gross Domestic Product (GDP) of $131billion, Lagos had been able to appropriate its cultural values, especially the multi-ethnic and cosmopolitan nature, to confront its security and governance challenges. Governor Ambode was confident that the country stands to gain from the model which Lagos has adopted in fighting crime and administering governance. Recalling security challenges faced by his administration at the initial stage, he revealed that the government garnered the support of the security agencies to set up military bases and security operations in fighting the menace. The governor attributed this to the rescue of kidnap victims and arrest of kidnap kingpins in Lagos, while further steps were taken on intelligence gathering and community partnership, as well as huge investment in security.